Having your initials or name projected on the wall or dance floor at weddings has become a popular way to add a touch of elegance. It is also popular to project a business logo for advertising and entertainment applications. The triple monogram is most popular at weddings, with or without elaborate details. This design was duplicated on the cake and cocktail napkins. The single monogram on the stone wall of the Ridglea Country Club ballroom is an example of how simplicity can be elegant. This couple had their initials inside of linked rings. It’s called Gobo Projection. “GOBO” is an acronym for “Goes On Before Object,” an arcane bit of trivia, but a technique that has been used in stage lighting for many years. Examples of metal Gobos and holders for stage lights. 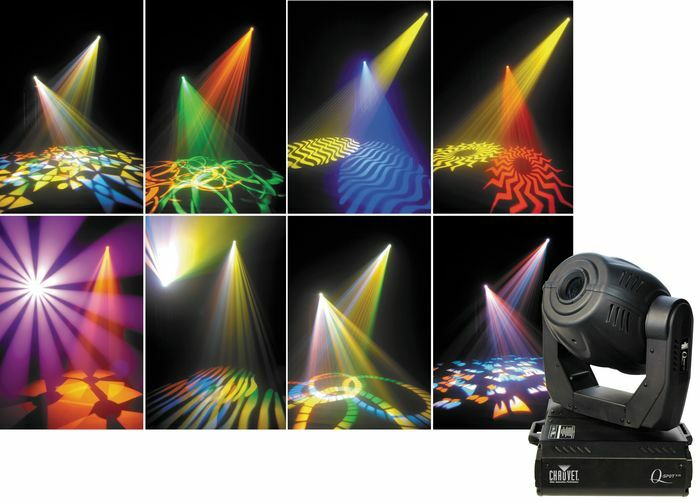 Think of a Gobo as a “cookie-cutter” placed in a spotlight’s beam to project a pattern. It works much like the “Bat Signal” in the Batman movies. 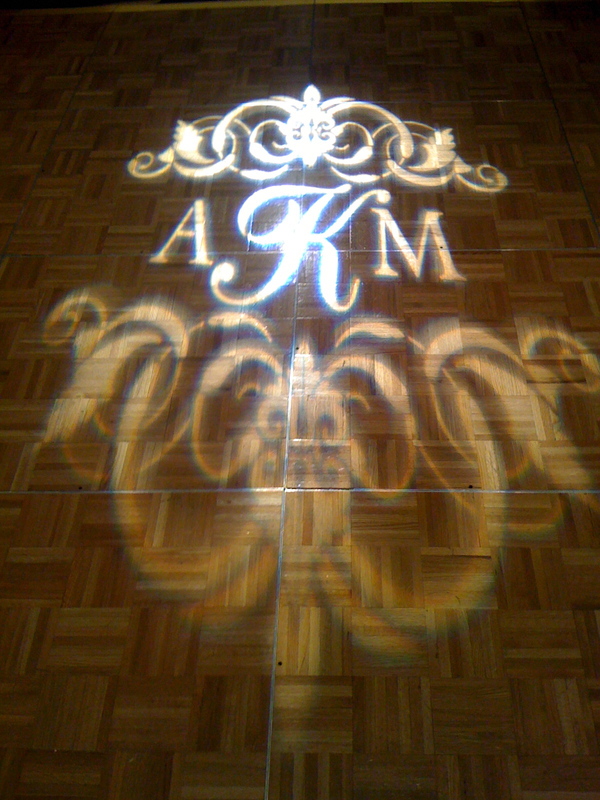 While the Bat Signal may not go with your wedding décor, a Gobo can be made that will project anything you wish. Stationary triple monograms are most popular for weddings, although many couples project their full names and sometimes the wedding date. 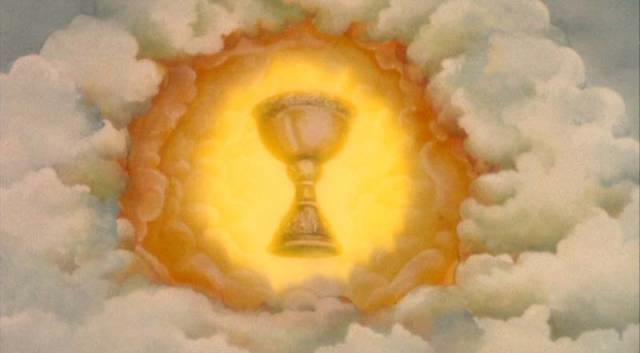 "We seek the Holy Grail!" Another popular movie image of pattern projection comes from the comedy classic Monty Python and the Holy Grail, in which King Arthur’s knights are encouraged in their quest by images of the Grail viewed in the clouds. In the Castle Anthrax scene, Zoot lures them in with a beacon, that “is Grail-shaped.” Easy to do, with Party Machine technology! Gobos may be used in many types of lights, but they look best when projected from an ellipsoidal stage spotlight, called a “Leko” in the industry, that is bright enough to show in a daylit room, with quality optics for sharp focus. The ETC Source Four ellipsoidal spotlight is an industry standard. It can hold a stationary or motorized Gobo, color gels, and is available in different beam widths to control image size and distance. Several stage light makers have introduced compact halogen lights specifically for Gobo projection that use minimal power and have quality optics. There are also some cheap plastic fixtures sold in party stores, but their poor optics cast a fuzzy image, and they lack the brightness needed to punch through ambient light. Gobos can also be projected from many “Intelligent” moving-head lighting instruments. The effect can be absolutely breathtaking. Imagine a searchlight sweeping the room, with the bride’s name, as a light sweeps from the other side projecting the name of the groom, and dramatic music fills the room. When the searchlights converge in the center, the light changes to pulse “Mr and Mrs” as they make their Grand Entrance. One reason for the popularity of Gobo lighting is that printing and laser technology have made it cost effective to make custom gobos. Virtually any pattern, graphic, or image you can imagine can be made into a Gobo. 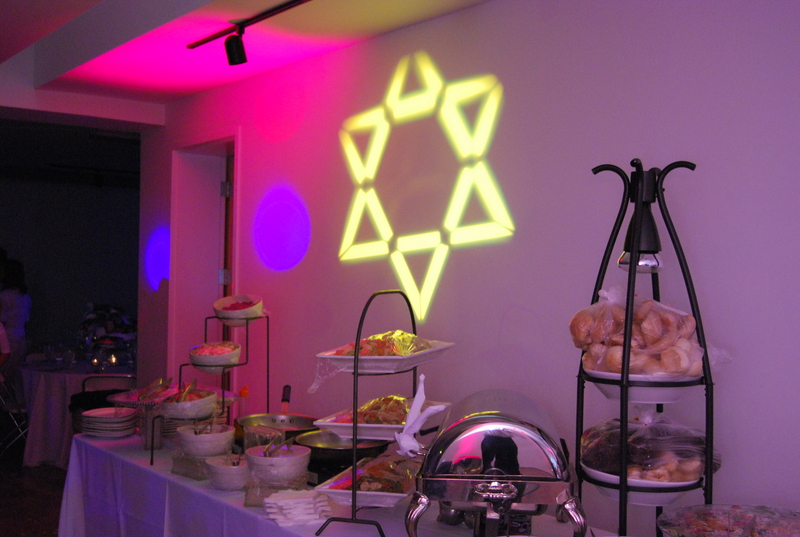 This Star of David image is definitely Kosher! Party Machine Celebrations offers two types of custom Gobos, and a variety of lighting choices. 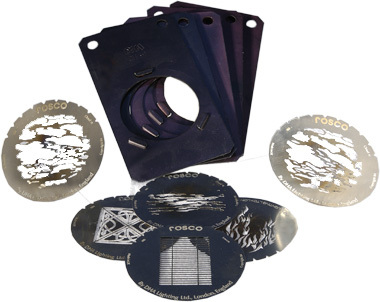 Metal Gobos are the least costly and most popular. Most names and initials look great in this stencil style. The drawbacks are that they can only be projected in a single color, and there are tiny stencil connection tabs. The second type is the more costly glass gobo, which are often used for corporate logos and multi-colored images. 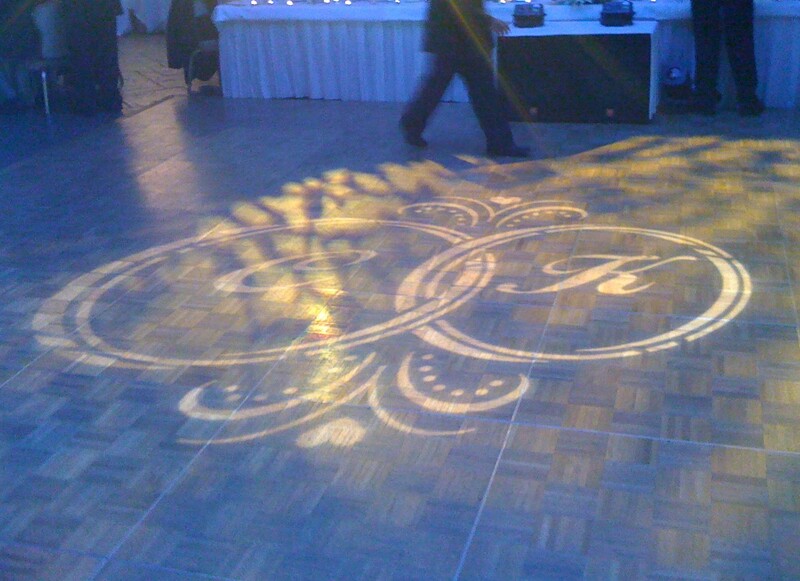 Many “Intelligent” fixtures require a glass Gobo, and intricate designs generally look better in glass. Multiple spotlights with Gobos can be used to create patterns and textures on walls, ceilings and floors. A Gobo light can project images of windows onto bare walls, or tropical palm trees onto a snowdrift. There are thousands of inexpensive stock Gobos available for themes and holidays, and new ones are released every year. Inexpensive stock Gobos are available for every theme and holiday. “Your Name In Lights” is a great way to add dramatic impact to celebrations. 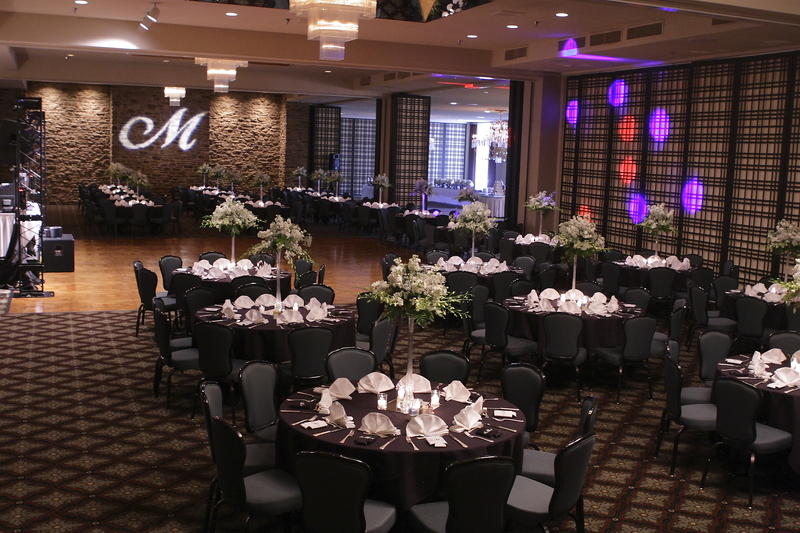 Contact Party Machine Celebrations at 817-294-9539 to discuss creative ideas for decorating with light. My daughter sweet 16 is next month 2/16/12, I wanted to know if its to late to order her name (REGGINE) and what is the cost? Yes, you can order custom GOBOs from Party Machine Celebrations. E-Mail your designs to scotts@partymachinetexas.com. CAN I PURCHASE THIS LIGHT AND HOW MUCH DOES IT COST WITH THE NAME. I’m getting married and would like to have one of these elegant lights to walk in with. Do I need 2 lights for my fiancee and I names. The lights are costly to purchase, about $300 to $500 for an ellipsoidal spotlight, depending upon the lens. For one-time use, it’s better to rent. Custom gobo designs are about $75 in steel and about $200 in glass. PM Celebrations will have custom gobo designs made for you, and provide the light for $250 with any of our wedding services.